Danganronpa's "School Life" mode allows the player to explore other characters without the pretense of murder. Publisher NIS America discussed how it worked on localizing upcoming murder mystery game Danganronpa: Trigger Happy Havoc in a recent interview. The game's script editor also briefly described an additional storyline Spike Chunsoft added to the Vita version. Trigger Happy Havoc is a rerelease of the original Danganronpa in which students are trapped in a school. Their only means of escape is the murder of another student, but the murderer must also trick the other students into thinking someone else committed the act. The added storyline to Trigger Happy Havoc starts out differently. "Without giving too much away, School Life mode begins after beating the game for the first time," script editor Phoenix Spaulding said. "You'll have the choice to begin this mode, which explores what might happen if the students were all trapped in the school together but weren't forced to begin killing each other. So this mode will offer a new storyline and new gameplay mode, and on top of that you will be able to hang out with students one-on-one to explore different parts of the school, as well as learn even more about them than you did during the main game." NIS America avoided a popular fan translation that already exists to ensure the fan translation did not influence the company's own localized script. Spaulding mentioned there are a few minor differences in name spellings. 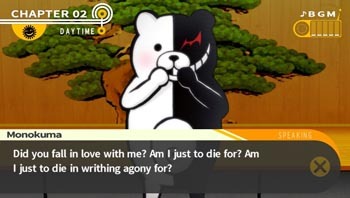 The only specific request Spike Chunsoft gave was to keep the name of Monokuma, the teddy bear antagonist. A localization of the game's sequel may be on the horizons, depending on how Danganronpa: Trigger Happy Havoc is received. "We put a lot of time and resources into this game," Spaulding said, "and if fans respond positively and we see that there's a real audience for this series in the West, we would definitely be open to exploring what else we might be able to bring over." Danganronpa: Trigger Happy Havoc will be available on the Vita on Feb. 11 in North America and Feb. 14 in Europe and Australia.